In one of my blog posts about Intermediate result of APD process a question was raised via comments. 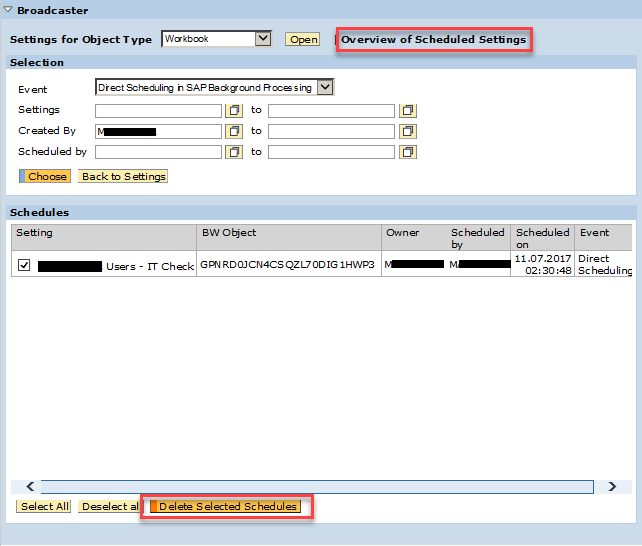 User asked where is ABAP code used in APD processes stored. Of course I replied back with the table name (RSANT_PROCESS) where the code can be found. Then the user replied back with another comment saying that field XML of that table is not completely readable as only first 131 characters is visible. SMUM_XML_PARSE - parsing XML document into a table structure, delivered within User Management of SAP Markets (it was SAP initiative around year 2000 which later merged with SAP Portals). lo_fun           TYPE REF TO cl_salv_functions_list. PARAMETERS: p_apd TYPE rsan_process OBLIGATORY. SELECT SINGLE * FROM rsant_process INTO ls_rsant_process WHERE objvers = 'A' AND process = p_apd. I mentioned the TLOGO term in my previous post. I just add short explanation of what it means. The TLOGO just represents different BW object types. For more details see domain RSTLOGO in data dictionary. The different TLOGOs can be also spotted in t-code RSA1 in Metadata Repository. The report runs fine while running it outside the portal in BEx Analyzer, Analysis for MS Office or via t-code RSRT. 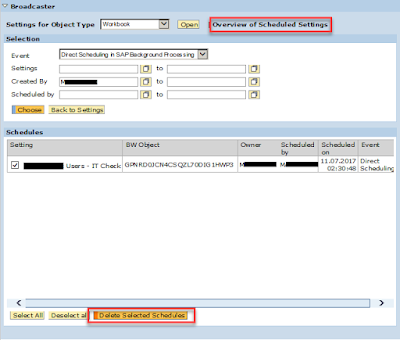 There are below SAP Notes available that fix this issue. However these SAP Notes are only relevant for SAP BW 7.5 SP06 version. As in my case BW version was 7.4 so the Notes are not applicable. Root cause within one of BEx variables type of user exit used in the query which populated wrong value. Loads to Open Hubs (OH) are pretty much automated. This is meant in a way that there is normally not needed any manual user interaction. However in case load has failed and it needs to be deleted there are not many options left. One of the options is to just see DTP associated with the OH. There is icon on tollbar called on "Last Request". This gets to data load request maintenance screen. By manipulating the request status via "Where-used List" button we can influence the load e.g. to delete it via setting it to failed status - red. Another option is to run FM RSB_API_OHS_REQUEST_SETSTATUS. This FM set the status of the OH in load monitor. As input parameters an request ID, desired status (R = Red; G = Green; N = New; O = Data Request) and finally message – text that will be shown in monitor. All 3 params are mandatory. Once the FM runs the OH request is set to the desired request status. I encounter below issue while exporting hierarchy data from InfoObject to other systems. I had enabled my IO with settings “Characteristics is Export DS” available on Master Data/Texts tab of the IO maintenance screen. This means that characteristic is used as export data source. So its attributes, texts, and hierarchies of the IO can be extracted into other BW systems via Data Mart Interface. Afterwards I created export DS via doing right click on the IO and choosing menu Additional Functions -> Create Export DataSource. Notice that the export DS for hierarchy are still working in 3.x version fashion. Also the version of such a DS is always only modified and the DS is self is Emulated. Same settings you can observe in t-code RSDS. Job terminated in source system -> Request set to red. The current ABAP program "SAPLRSSG" had to be terminated because it has come across a statement that unfortunately cannot be executed. Field "/BIC/C5DU8_IOname is unknown. It is neither in one of the specified tables nor defined by a "DATA" statement. It was obvious that data element as described wasn’t present in the system and it even wasn’t supposed to be in there. Actually issue was within method for loading of data. This information for particular DS is stored in table ROOSGEN - Generated Objects for OLTP Source. In my case it was set to T that means transactional RFC but once I corrected it into I (Idoc) my upload worked. There are few forum posts about this issue in SDN like here and here but solution is not provided within the posts. I hope this blog will be useful for people who face same issue. I came across following issue while dealing with expert routine. There was a DSO object as target of TRFN. Key figures within the TRFN were updated but they weren’t aggregated. Basically values of KFs from last row that was processed were updated into the DSO but not values form previously processed records. So at the end the KFs were not summed up – no aggregation took place and what was going on was that there was just a move operation executed. If one wouldn’t need this behavior then it must be overcome in custom coding within the expert routine. Data in result package must be collected instead just appended. Below is example of how to do it. TYPE: t_ty_t_TG_1 TYPE SORTED TABLE OF _ty_s_TG_1 WITH NON-UNIQUE DEFAULT KEY.